HA NOI (VNS) — Low supply has seen tra fish prices rise in the domestic market, but experts have cautioned farmers against ramping up production, saying the export market is still unstable. Since mid-March, the purchase price of tra fish in the Cuu Long (Mekong) Delta region has risen to VND25,000-26,500 per kilo from VND20,000-21,000 just before the Tet (Lunar New Year) holiday in January. A Nguoi Lao Dong (Worker) newspaper report yesterday quoted farmer Nguyen Van Tan of An Phu District in An Giang Province as saying that in the last 10 days, many traders and processing enterprises have rushed to buy the fish, pushing up prices. His family was lucky to harvest 200,000 tonnes of the fish right at the time that prices increased, he said, adding that if he had done it earlier to cut losses, he would not have made any profit. Nguyen Ngoc Hai, chairman of the Thoi An Trafish Co-operative in Can Tho City, attributed the sudden surge in purchasing prices to a lack of supply in the market as a result of households abandoning tra fish farming after three consecutive years of losses. Nguyen Thi Ngoc Duyet of Cao Lanh District, Dong Thap Province, said she has reduced the number of tra fish ponds from 20 three years ago to a handful at present. She said the three years of losses meant they did not have any money to expand breeding area. According to the Viet Nam Association of Seafood Exporters and Producers (VASEP), the area of tra fish farms has fallen in many provinces and cities including Can Tho City (reduction of 10 per cent), Vinh Long (10 per cent) and Dong Thap (4.7 per cent). The Thoi bao Kinh Doanh newspaper reported recently that as many as 70 per cent of the tra fish breeding households have stopped production. The supply shortage would continue until June when farmers harvest the tra fish they are breeding at present, the association said. In March alone, tra fish output has fallen year-on-year by 30 per cent, the report said. While the current situation of high purchase prices and low output has enthused many farmers to resume tra fish breeding and farming, they are stuck with a shortage of funds to do so, said Pham Van Quynh, director of the Can Tho Agriculture and Rural Development Department. However, Tran Van Hai, general director of the Phat Tien Seafood Ltd Company in Dong Thap Province, said the increase in prices "contained many factors of instability." He noted that the increase was a result of short supply, not an increase in export prices. He said the situation of exporters facing many challenges and many facilities processing tra fish for export having to curtail or suspend production has not changed. The An Giang Aquaticulture and Seafood Export Association has said that consumption markets are unpredictable at present. 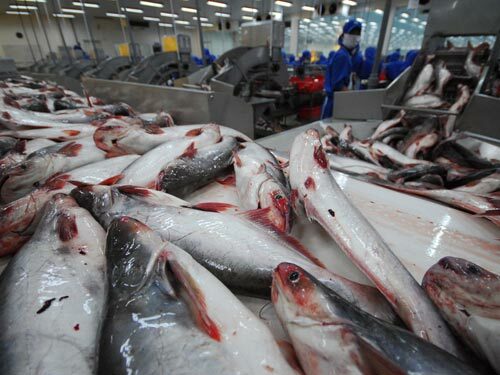 Many tra fish exporters have complained that importers have pressurised them to cut prices and some others have confirmed they are facing difficulties in the Russian, Ukrainian and Eastern European markets. Therefore, farmers should not rush to expand tra fish production in large volumes so as to avoid a situation of oversupply and resultant drop in prices, the association said. Nguyen Ngoc Hai, chairman of the Thoi An Trafish Co-operative in Can Tho City, said not many small households are breeding or farming tra fish these days. Those who have persisted are enterprises or households that have supply agreements with enterprises, he said. Such agreements can bring about sustainable development of the tra fish industry, Hai said. VASEP deputy chairman Nguyen Huu Dung said that for the long term, a balance should be maintained between supply and demand by imposing an output quota on each locality. The government should also set up quality standards, fix minimum prices for tra fish, establish a proper distribution network in Europe first and expand it later to other markets, he said.